First of all, CONGRATULATIONS! You’ve found this recipe and are ready to make and eat the results. But first thing’s first. There are a few prepping steps you’ll need to do ahead of time if you want to be successful. And who doesn’t want to be SUCCESSFUL!? So for reals, if you want to bask in this cake’s full glory, I highly recommend you use the right tools and follow my instructions. Get a spring form pan! OR get a 9″ round cake pan. Make sure the walls are 2″ deep. This recipe can use either type although not all recipes are interchangeable. I’ll tell you why in a second. 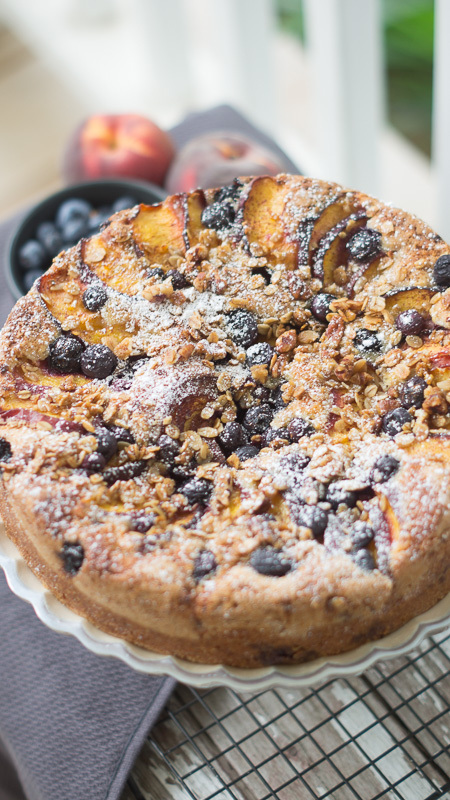 I used the USA brand 9″ Round cake pan for this particular instance. You can purchase that brand at Bed, Bath & Beyond as well as online. So what’s the difference? Let me educate you. I found this awesome blog that features other things you can also make in a spring form pan- check it out! 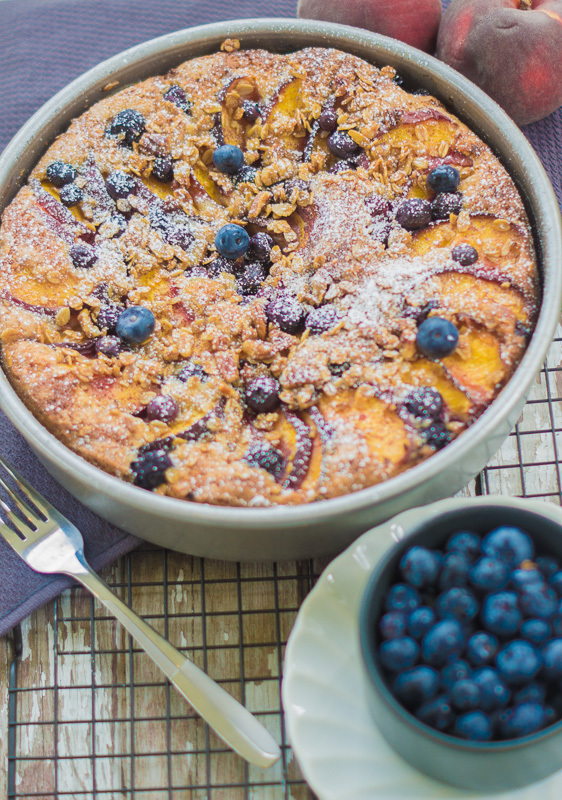 Click here —-> 10 Things to Make in a Springform Pan! Some disadvantages to a spring form is that they can sometimes leak out of the bottom. 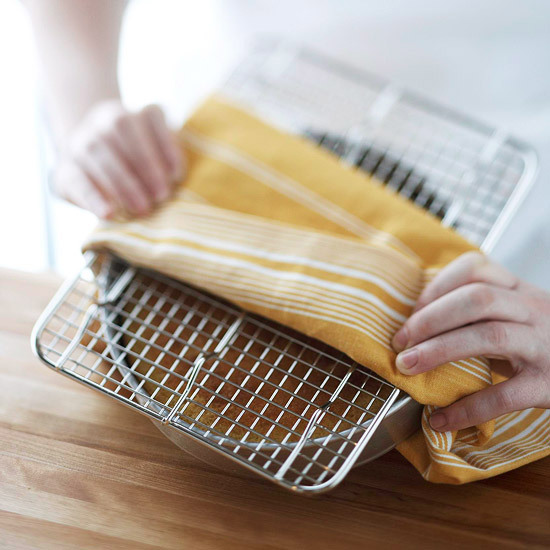 Be sure to place it on a baking sheet when putting in the oven so you don’t have to break your back cleaning out the floor of your oven when the drippings burn. ALSO! I’ve read many an opinion about brands and it sounds like if you get a good German one–Kaiser in particular, then you have found a quality product. I have not heard good things about the made in China brands, but if you find one at a thrift store for cheap, it never hurts to pick it up for a dollar and experiment with it. Until you’re ready to move up to more quality goods, that’s a-Ok. 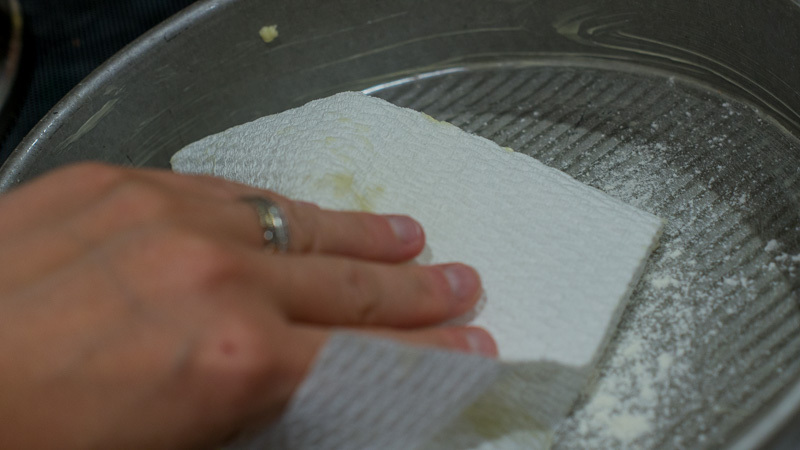 Some people put parchment paper between the bottom piece and the ring, and then trim the edges, to prevent leakage. You find what works for you. I know I’ve gotten lucky at thrift stores and found good brands that people just throw out because they don’t know what they had! 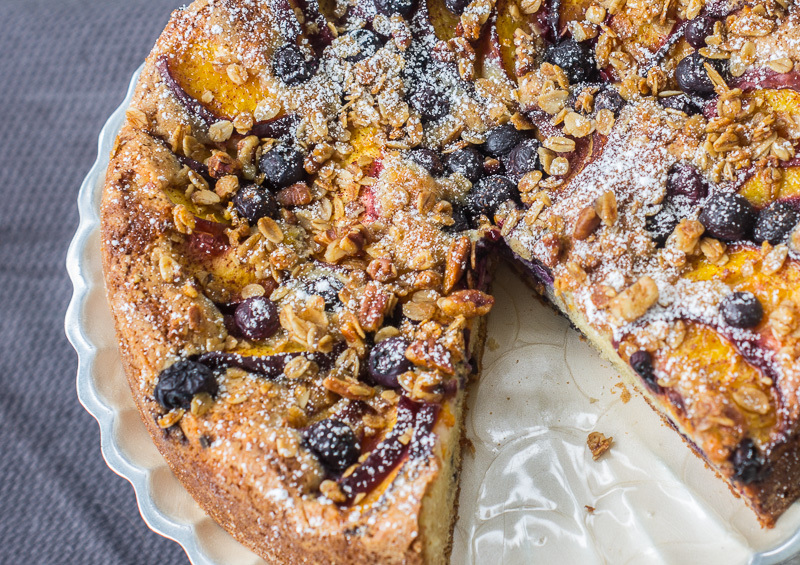 A standard round cake pan with tall walls will get you the same shape and result BUT depending on what you make in it, you have to flip it upside down to get the goods out of the pan. So for instance, a cheesecake would not work in a round pan. They tend to have a heavier gauge of aluminum all the way around, and of course do not have a removable bottom. 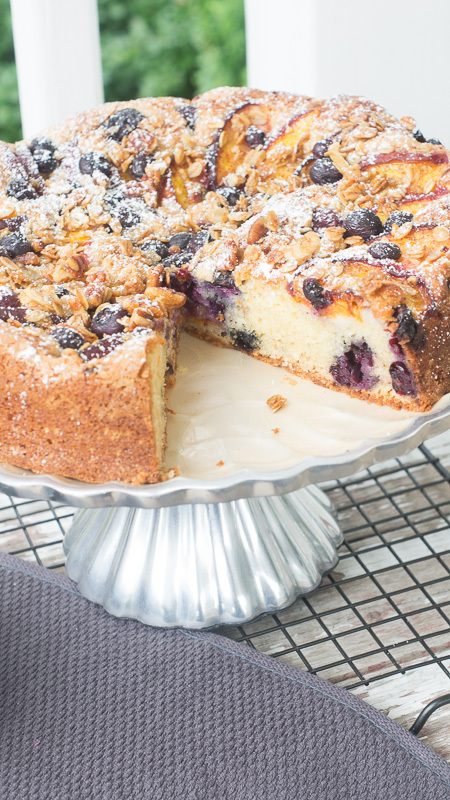 If you prep the pan right, you can flip a cake out of it with ease. Watch and learn! 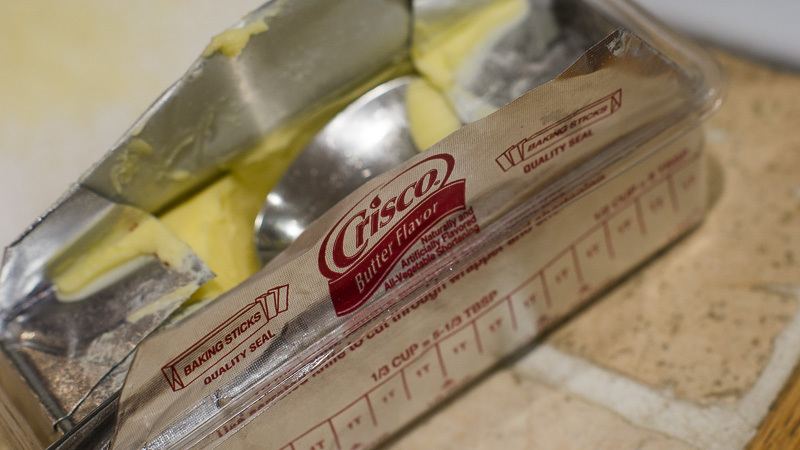 Get crisco, flour, napkins, parchment paper, scissors, a marker, and two wire cooling racks. Next, trace the edge of the BOTTOM of the pan with your marker. If you trace the top (pan upside-down), the lip will make it too big and you’ll have to trim it. Cut out the circle of parchment and set aside. After greasing, sprinkle with flour. Grease the sides of the walls too!!! Take your parchment circle and lay it in the bottom. Grease and flour the parchment paper as well. 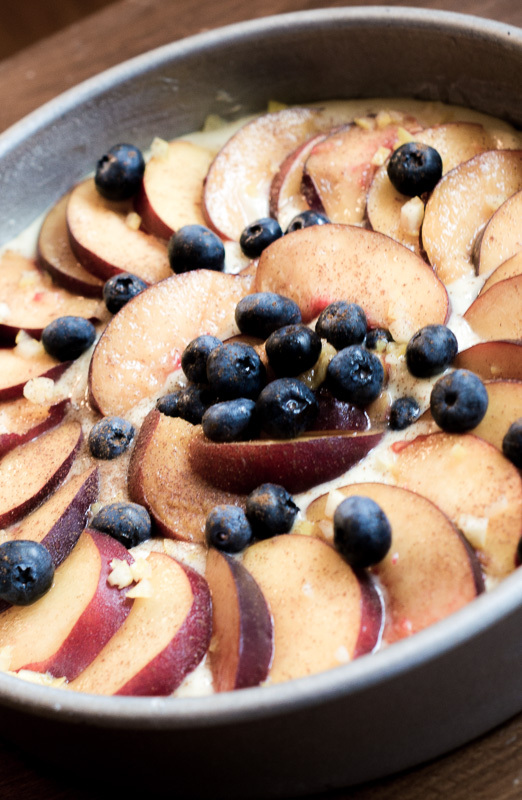 Now that your pan is prepped (believe me you’ll be so glad you did this first)…you can move on to the actual recipe. 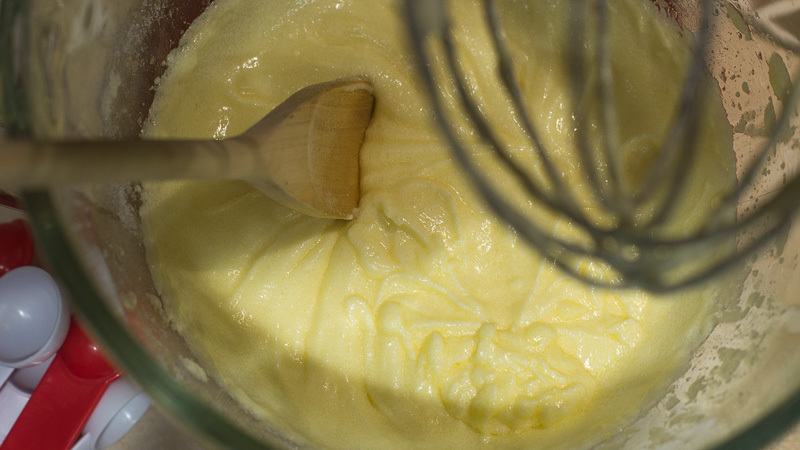 Next, beat butter, sugar and eggs together until fluffy. 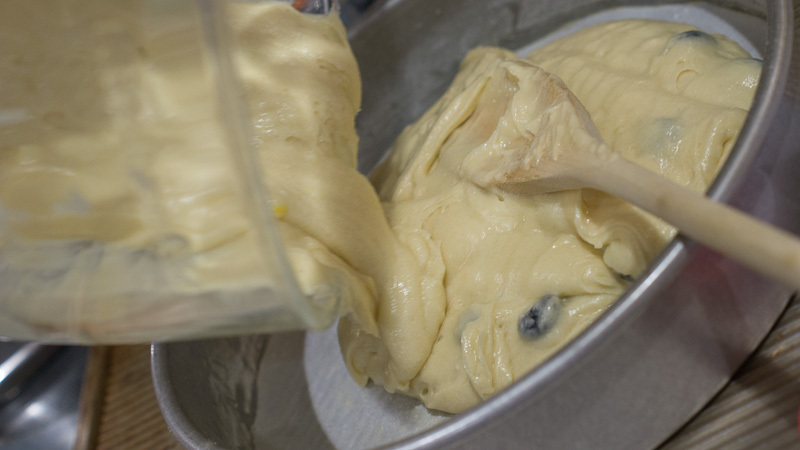 Add the other wet ingredients (vanilla and yogurt), until creamy and light in color. 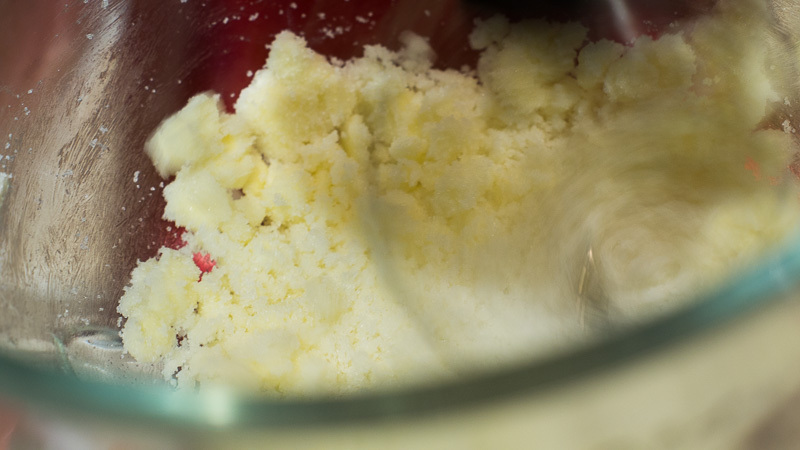 Keep the mixer on low and add dry ingredients, and lemon zest until just combined. 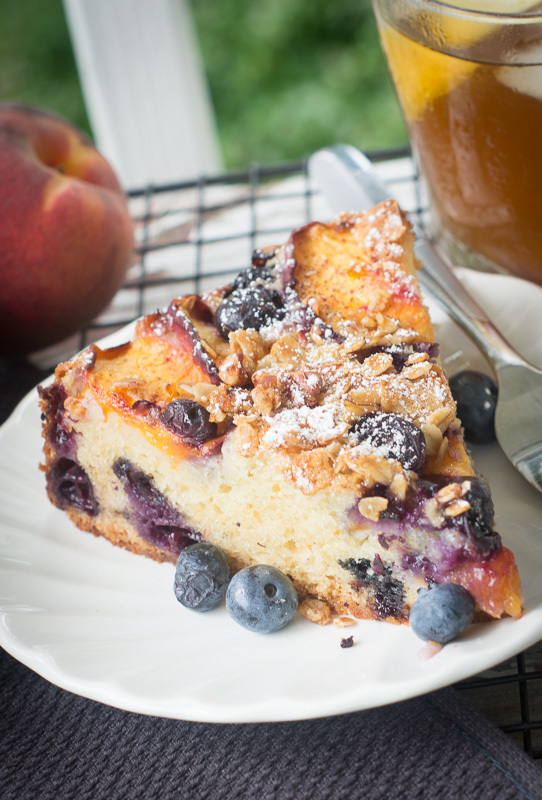 Toss in a few blueberries and spoon into greased, floured, parchmented pan and don’t forget to lick the spoon! Oh boy I bet you can’t wait to actually bake it! 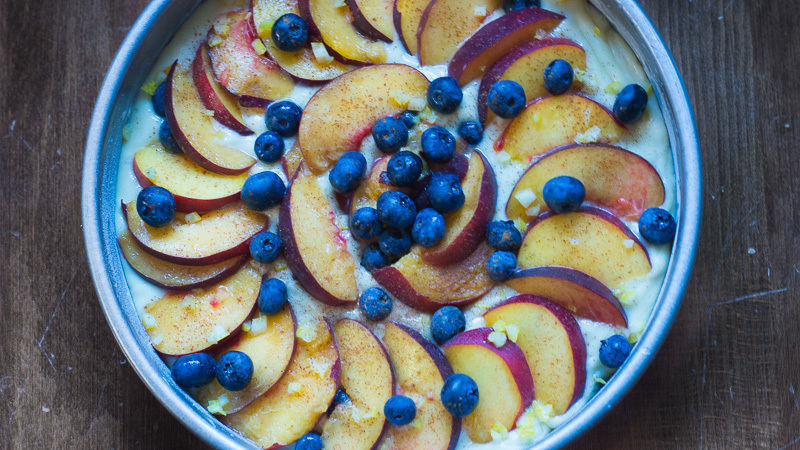 Top with sliced peaches and blueberries as you see fit. I tried to arrange mine in a pretty manner. 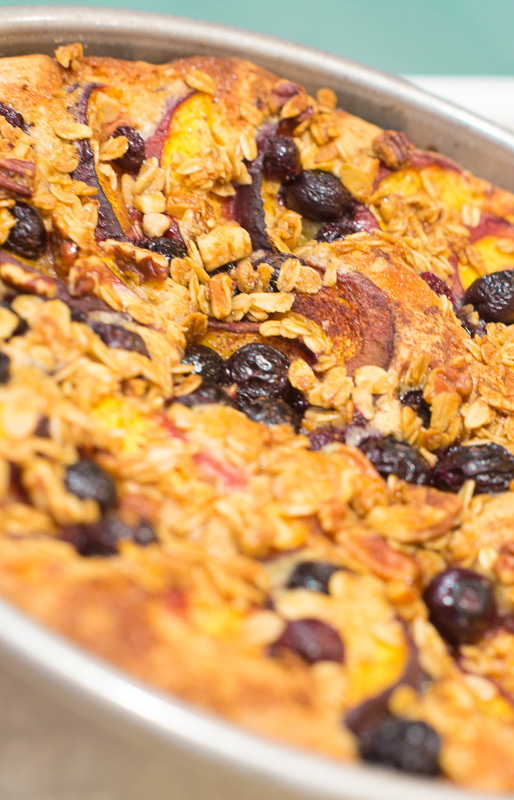 Sprinkle granola mix and tablespoon of sugar over the fruit. Make sure it is NOT full to the top, just incase it tries to escape and drip over the side. 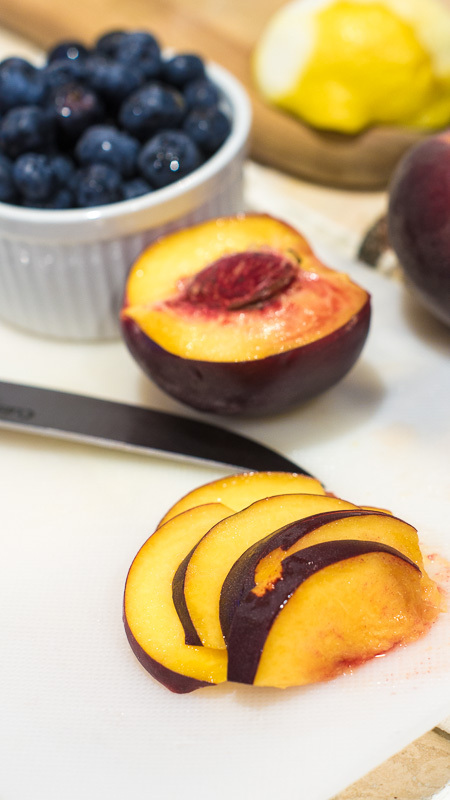 Slice peaches in half, remove pit, then slice evenly. 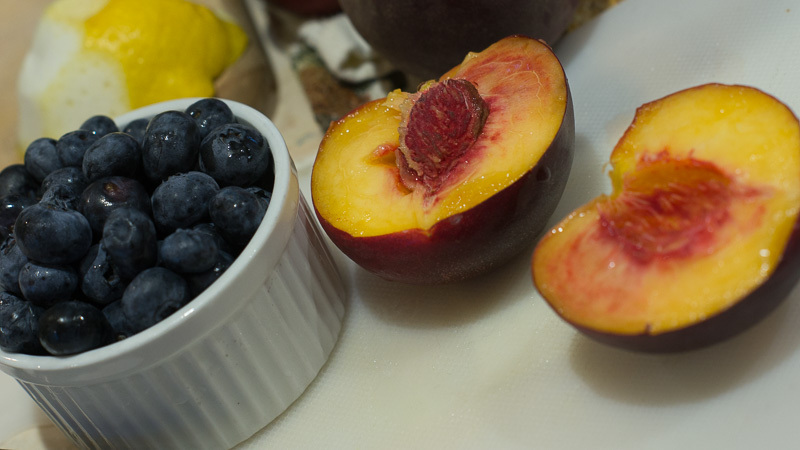 Fresh Colorado peaches are some serious YUM. Are we ready to get cooking’!? 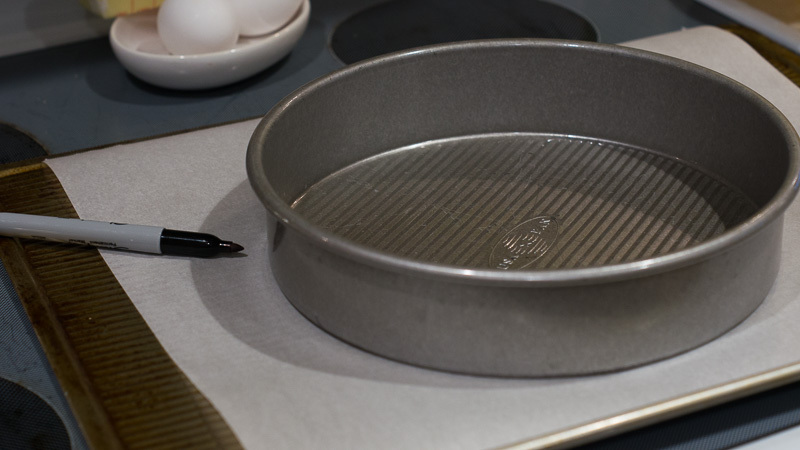 Set round pan on a thin baking sheet just incase of spillage! 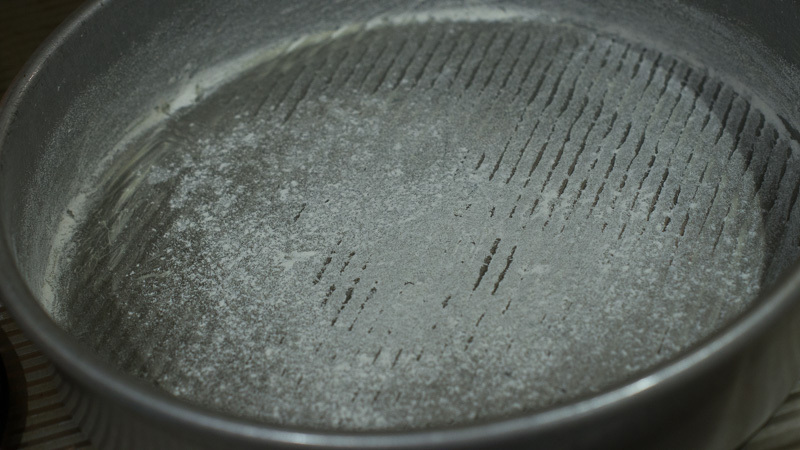 For springform pan: Bake between 55 to 60 minutes. 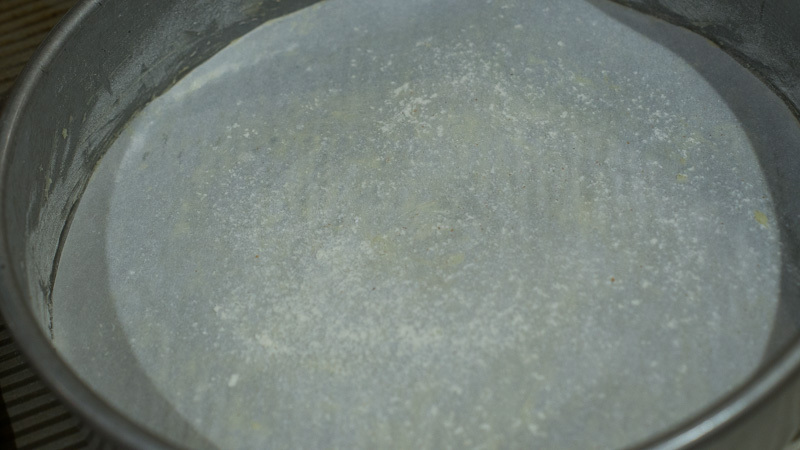 For 9″ round pan: Bake between 40 and 60 minutes. Your oven may vary. Stick a toothpick in the middle and test to see if it comes out clean. It will be golden brown in color. 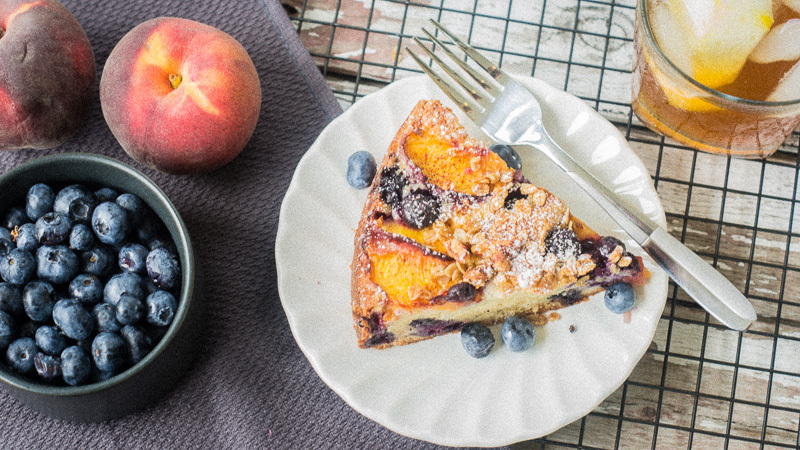 **NOTE** For a “prettier” cake, you can add more fruit halfway through baking as contents may sink into the batter. 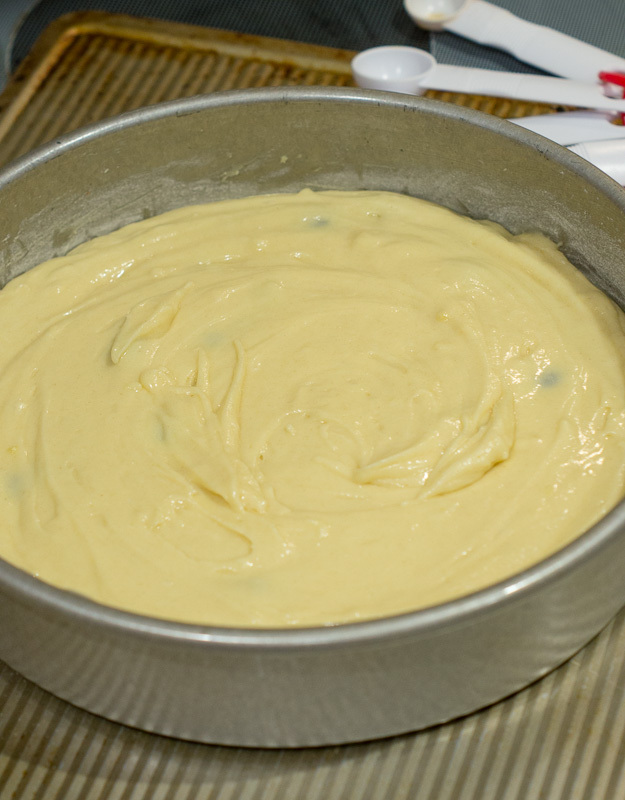 To turn out cake, take another wire cooling rack and place it upside down, over the top of the pan. 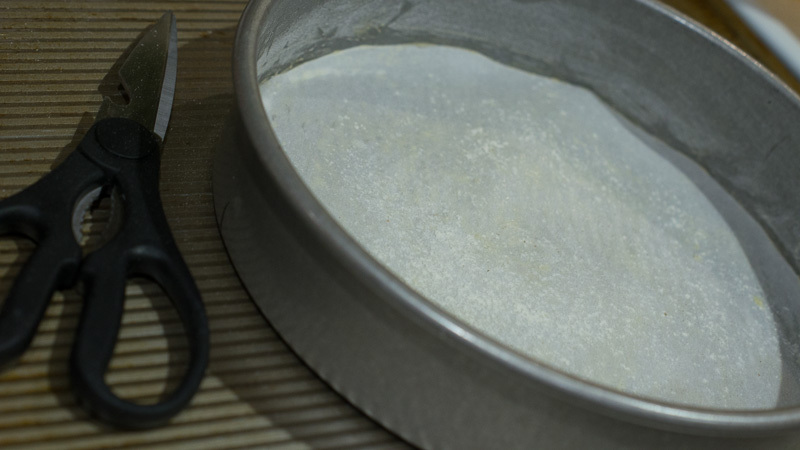 Turn the round pan upside down while holding the wire rack firmly underneath it. Do this carefully and over a countertop. Use your body to shield the cake from the edge of the counter in case it wants to go base jumping onto the kitchen floor! 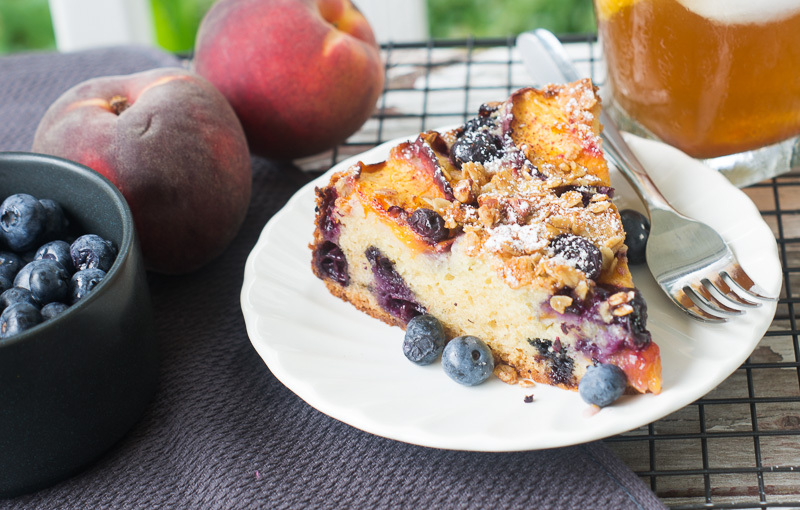 You can use a second wire rack to place it over the upside down cake and flip it back right side up. Using a hand towel may also help! Here is a visual I found on Better Homes and Gardens! 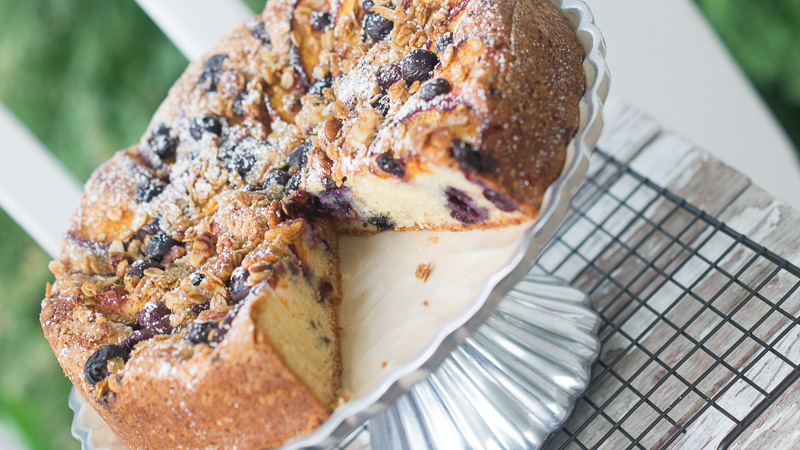 After cake has cooled, sprinkle with powdered sugar, and then blast social media with all the awesome photos you’re going to take of it, because it’s going to look and TASTE awesome. Enjoy with coffee, tea, friends, or all by yourself! 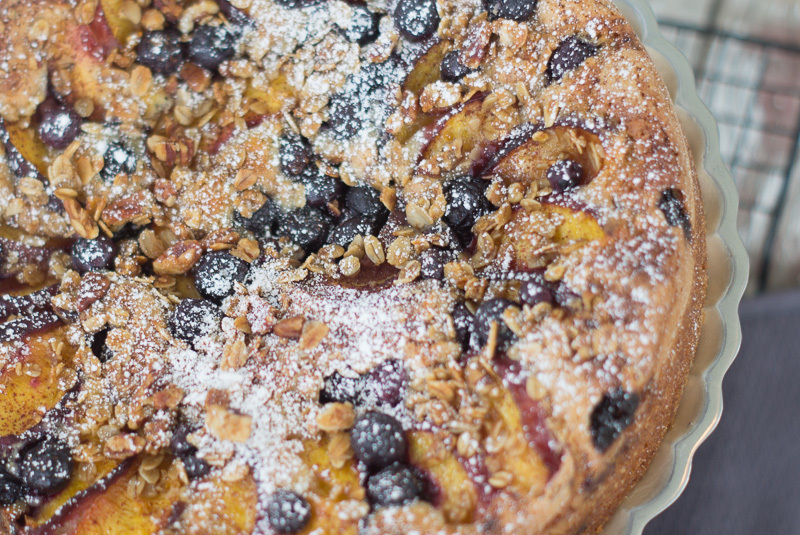 The delicious is in the details! 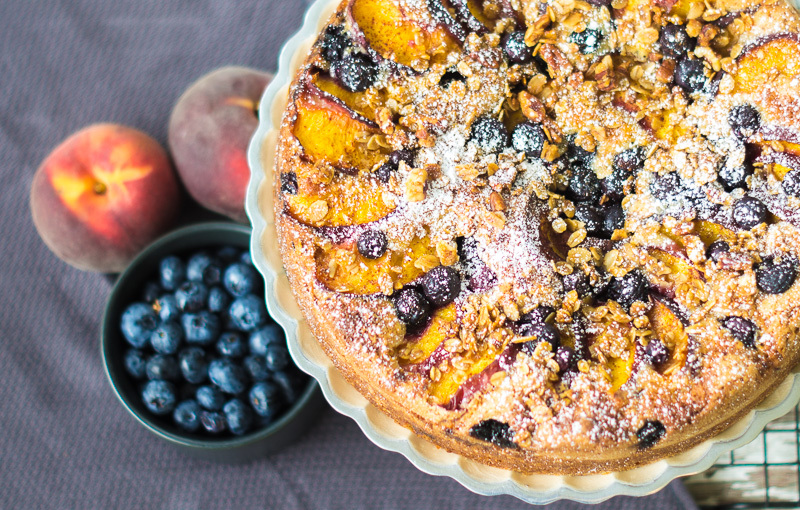 What a perfect summer treat for anytime—Yes even breakfast!! I know for certain I will be making this again and again. Enjoy! 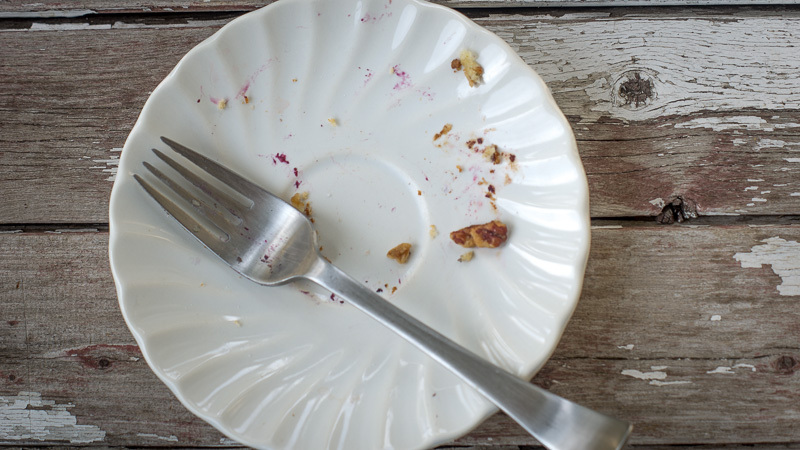 And as always, this recipe is so good, you’ll have nothing left but an empty plate! Devil’s Food & Oreo Birthday Cake!